The cost of building cars in high-wage Germany is among VW's profitability challenges. 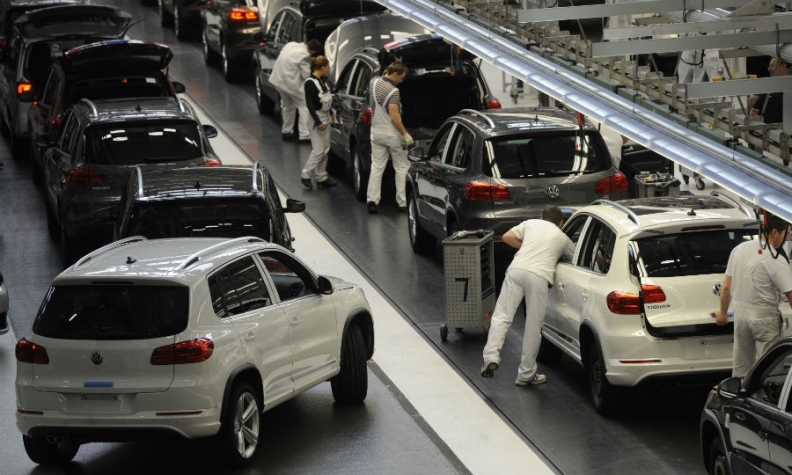 Pictured are VW Tiguan SUVs on a production line at Wolfsburg. BERLIN (Reuters) -- The record quarterly earnings which Volkswagen Group is set to report on Tuesday may mask more fundamental problems for the automaker. A 6 percent increase in first-quarter deliveries, which VW revealed earlier this month, will help Europe's biggest carmaking group meet its 10 million vehicle sales goal four years early. However, profitability gains are not keeping pace with the group's rapid expansion. Behind the scenes there is evidence of faltering competitiveness at the core VW brand, some analysts say, and the group faces a struggle to both raise output and margins. The group's 2013 figures, released in March, showed revenue surging by a quarter over three years to reach almost 200 billion euros ($276.6 billion) - for comparison, about the size of Israel's GDP. But yearly operating profit rose just 3.5 percent to 11.7 billion, held back by increasing investment and labor costs. VW's global workforce swelled to 573,000 in 2013, up over 40 percent from 2010, and it splashed out on a generous 5.6 pct two-step pay rise last year for workers in high-wage Germany. First-quarter 2014 results may underline the need for further action, said London-based analyst Arndt Ellinghorst at brokerage ISI Group, who expects the core VW division's operating margin to fall to 2.3 percent from 3.3 percent. The quarterly figures are forecast to show group operating profit up 17 percent to 2.74 billion euros, a Reuters poll of 11 banks and brokerages showed. "Cost pressures keep growing and the namesake brand is VW's biggest trouble spot," said Ellinghorst, citing negative currency effects, depreciation costs and slowing emerging-market growth among the company's hurdles. To boost efficiency across the 310-model empire, VW is reviewing strategy and updating business goals as it seeks to narrow the profitability gap with Toyota Motor and Hyundai Motor. To expand margins, VW is increasingly relying on its modular platforms allowing it to cut production costs and build vehicles more rapidly. CEO Martin Winterkorn has said that challenges persist despite increasing profits, saying in a recent magazine interview: "It's our job to build great and valuable cars and at the same time to increase the margin." Despite early doubts among analysts about potential synergies, VW expects to save 1 billion euros in production costs this year as the number of cars built on the new so-called MQB platform may almost double to 2 million and rise to 4 million by 2016. VW is targeting a margin of more than 6 percent for the mass-market car brand, which accounted for almost two-thirds of the group's 2.4 million vehicle sales in the first quarter (excluding MAN and Scania heavy trucks). That compares with auto division margins of 8.8 percent at Toyota and 9 percent at Hyundai last year. Ellinghorst nonetheless expects VW's group operating profit to rise to a record 12.6 billion euros this year on improving European sales of luxury Audi and Porsche models. VW has used resilient gains from both premium marques to help sustain investment even as a slump in European car markets sent French and Italian peers into the red. But generating cash to fund global expansion is getting harder as VW balances short-term costs, such as 4.6 billion euros in 2013 adverse currency effects and rising distribution outlays, with upgrades and additions to its multi-brand lineup. In an indication of its struggle to maintain sales, confidential industry findings from one market research firm showed VW brand models having the biggest increase in average retail incentives in the European sector in the first quarter. VW discounts rose by a third to nearly 2,400 euros per car, narrowing the gap with an industry average of about 2,750 euros, according to the data for Germany, Britain, France, Italy and Spain. "Incentives are the very first thing customers ask about," said Ernst-Robert Nouvertne, who runs two VW dealerships near the German city of Cologne. "I don't think we'll ever get back down from that relatively high level." European car markets, which make up 40 percent of VW group sales, posted a seventh straight monthly gain in March following a six-year slump that cut registrations to a 20-year low. VW in February toned down its 2014 operating profit guidance, saying earnings will improve only if economic conditions pick up faster than currently forecast, particularly in Europe. Hanover-based analyst Frank Schwope at banking group NordLB said profitability may also benefit from deepening cooperation with Porsche, which VW acquired in 2012, and plans to align truckmakers MAN and Scania. VW is seeking full control of Scania to forge a truck alliance with MAN and its own commercial-vehicle division.